While a major chunk of the filmdom is quite evidently divided into the respective camps of Shah Rukh and Salman, the latter seems to be winning the ongoing cold war between them. 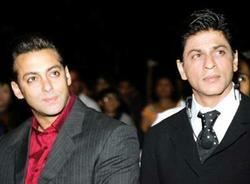 If the latest reports are to be believed, SRK has apparently lost some of his closest friends to Sallu’s league! Last year, friends-turned-rivals Shahrukh and Salman shared some hot arguments on Katrina's birthday party.Commenting on Sharukh's TV shows 'Kya Aap Paanchvi Pass Se Tez Hain', Salman abruptly said that although Shahrukh is a superstar, he didn't succeed in making shows popular. Shahrukh, who was present in the party along with his wife Guari Khan and friend Karan Johar, didn't react on Salman's teasing. On getting irritated, SRK too commented on Salman's ex girfriend Aishwarya.